Analysis of data from National Resident Matching Program, Charting Outcomes in the Match, 2011. National Resident Matching Program, Washington, DC 2011. To compare the match rates of residency applicants (US Seniors and independent applicants) with regards to the median contiguous rank in rank order list. Data was obtained from the Charting Outcomes in the Match, 2011. National Resident Matching Program a publication by NRMP. Values were tabulated for both independent applicants and US seniors and the match rates based on specialty were compared to the length of the rank order list as reflected by the median contiguous ranks. The match rates charted on the X-axis are plotted against length of rank order list on Y-axis. US senior applicants are in blue while independent applicants are in magenta. Both the data sets also depict a polynomial regression trend line denoting the trend patterns of the data points. as seen in Figure 1, Match rates and rank order lists for US Senior applicants are higher than that compared to the independent applicants. Rank order lists for independent applicants are shorter than those of US seniors. Match rates for independent applicants were lower than US Seniors. 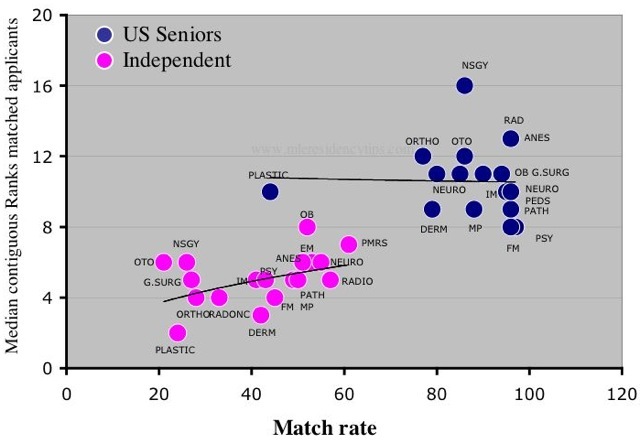 While applicants who matched had in general longer rank order lists, length of rank order list of the applicant did not have a correlation with subject match rates for US seniors. This is denoted by the relatively flat trend line, which passes through the US senior data points. Independent applicants who matched had longer rank lists. Increasing rank order lists for independent applicants do correlate with increasing match rates for particular specialties. The positive slope of the polynomial regression trend line denotes this. Figure 2: Normalized median rank order lists compared to match rates. 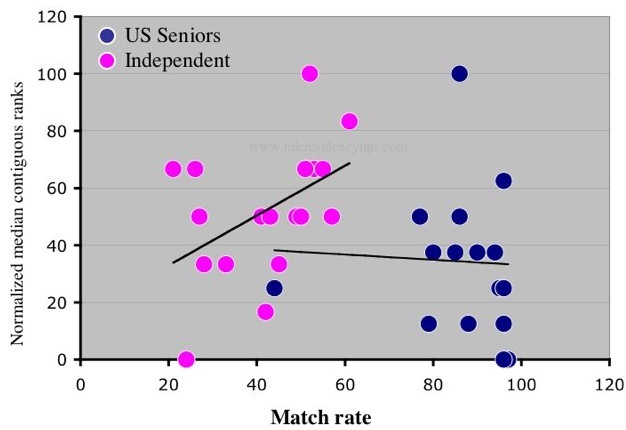 Since the length of the rank order list seemed to have some influence on the match rates for applicants, I normalized the rank order lists (using a min-max algorithm) for independents and US seniors and then created a scatter plot (Figure 2) of the match rates versus length of rank order lists. The results for the trend lines still seemed to correlate with the rank order lists as seen in Figure 1. Specialty specific match rates for US seniors do not seem to be influenced by length of rank order lists overall but within a specialty applicants with longer ranks lists are more successful. This is not the case of independent applicants, where specialty specific match rates seem to directly correlate with length of rank list.